Built-In Refrigerators are very popular and can be the centerpiece of your kitchen. Select a stainless steel model or you can choose a model that accepts custom panels to blend in seamlessly with your kitchen cabinetry. 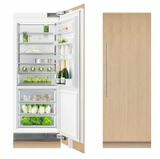 At US appliance we carry the best built in refrigerator brands at the lowest prices.